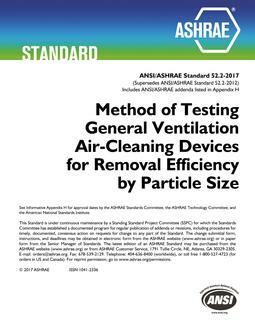 Standard 52.2 establishes a method of laboratory testing to measure the performance of general ventilation air-cleaning devices in removing particles of specific diameters. a. Modifications were made to the MERV table to adjust the threshold for specific MERVs and allow for the 16 graduations to be more observable in testing. b. 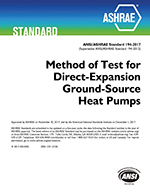 To address user concerns about reproducibility and reliability of the test method, ASHRAE commissioned Research Project RP-1088, a comprehensive round robin of multiple labs, including multiple levels of filtration performance. The changes in the 2017 edition of the standard are based on direct recommendations of the research project. c.	Changes were made with the intent of making the data on reports more mandatory. The goal of was to improve the user's experience by ensuring that reports being provided by labs and manufacturers shared the same data, allowing for a simpler evaluation of products. d.	New Informative Appendix K uses the base methodology to test across sequenced filters. 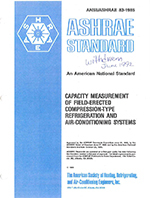 This allows users a method of testing their system in a controlled lab environment.